Some 9,156 tons of North Korean coal disguised as Russian product were exported to South Korea last October. Seoul did not stop the shipments even when it was tipped off about the real origin of the coal, though the importers are being investigated by the Korea Customs Service. North Korea is banned from exporting coal under UN Security Council sanctions. The government searched two ships registered in third countries, that carried the coal from a Russian port but took no action against them even though it had the authority to seize and detain them under a fresh UNSC resolution effective from December last year. They freely entered several South Korean ports on 24 occasions since late last year. According to a report by the UNSC, the North began illegal exports of coal by ship-to-ship transfers after exports were banned in late August last year. Six ships flying a Russian flag were involved in the shipments to South Korea. Four ships -- three North Korean and a Togo-registered freighter ship -- sailed to Kholmsk, a port in southern Sakhalin, with coal loaded at Wonsan and Chongjin in North Korea in August and September last year. 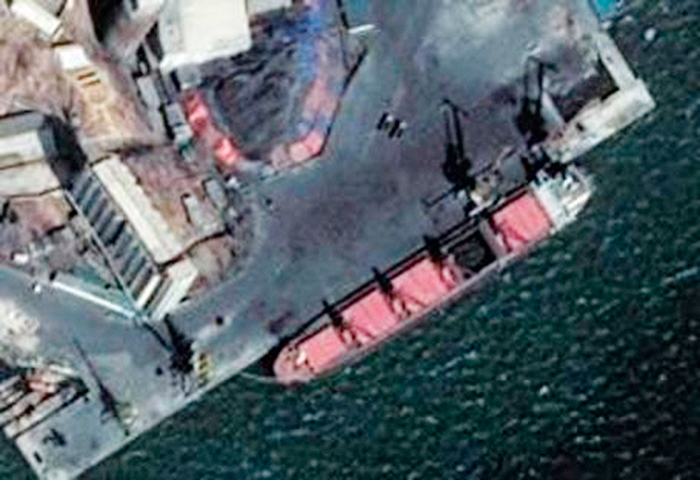 Coal is loaded on a barge at Nampo port in North Korea, in this satellite image taken on March 14. 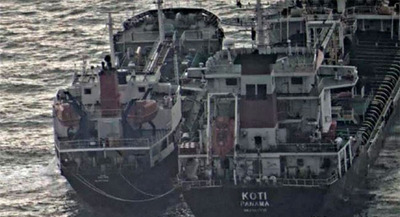 Satellite images obtained by the UNSC show that these ships were unloading the coal at Kholmsk. There they were picked up by the Panama-registered Sky Angel, and the Sierra Leone-registered Rich Glory. The Sky Angel arrived in Incheon on Oct. 2 last year with 4,156 tons of North Korean coal and the Rich Glory at Pohang on Oct. 11 with 5,000 tons worth US$325,000. According to the Foreign Ministry here, the South Korean government was tipped off that the coal was highly likely from North Korea. But the South Korean importers had already completed import procedures by submitting documents claiming that the coal was Russian. The government said until October last year there was no provision in the UNSC resolutions that obliged it to seize ships involved in the violation of sanctions, and the charges were insufficiently clear. But that does not explain why the government failed to seize the ships when they arrived after that. A fresh resolution adopted on Dec. 22 stipulates that "Member States shall seize, inspect, and impound any vessel in their ports" if the vessel was involved in activities like illegal exports "through deceptive maritime practices." Officials show that the Rich Glory entered Incheon, Busan, Pyeongtaek, Gwangyang, and Mukho on as many as 16 occasions between late December and July 6 this year. The Sky Angel entered Masan, Gunsan, Ulsan, and Pyeongtaek on eight occasions.